Classes are currently being scheduled at The Machine Gun Nest classroom and indoor range in Frederick, MD. Cost - $100 per person. Group discounts and gift certificates are available! NOTE: Private classes are also available by appointment, on weeknights and weekends. 4 person minimum, limited to 40 miles from Frederick, MD. Host pays only $70, rest of group gets 10% off! Email me for details. This is a 4 hour course that will satisfy the training requirements for the Maryland HQL . 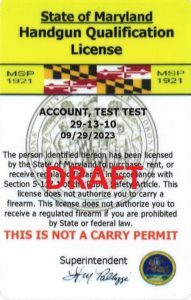 The HQL is required to purchase a handgun in the State of Maryland. This NRA course meets the training requirements for a concealed carry permit in various states (Florida, Virginia, etc. ), and is a great way to get familiar with a newly purchased handgun. This course is similar to the MD HQL course, but includes a bit more detail and covers a few more topics, such as handgun care an maintenance, and more in-depth marksmanship training. Cost - $150 per person. Group discounts are available! Email me for details and to schedule your class! If you need the Maryland HQL also, I will include the MD Law module for no additional charge and you will receive both certificates. This is a 16 hour course that will satisfy the training requirements for the Maryland Wear and Carry Permit. 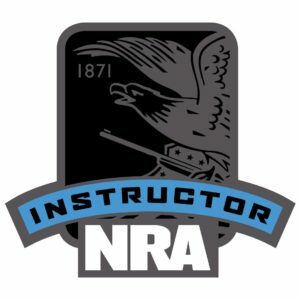 Includes the same material as in the MD HQL Course, plus 12 more hours of instruction on topics such as detailed firearm cleaning and maintenance, draw and fire techniques, USPSA competition coaching, and more. Cost will vary depending on your needs and what modules you would like to include. This course can be completed over multiple days, at your own pace and budget. I will come up with a fun, customized course plan for you that will satisfy all of the MD requirements and doesn't break the bank, for as low as $350. Email me and I will develop a customized course to fit your needs. Special Offer! - Click the link below to get special pricing on new and renewal NRA Memberships. $40 off for a 5-year membership! I am available for private instruction on an hourly basis, most evenings and weekends by appointment. I teach at The Machine Gun Nest indoor range in Frederick, MD. I specialize in handgun instruction, but I am happy to help you tame that shotgun or rifle as well. Email me with your training goals and I'll help take you to the next level. Cost: $65/hour. Includes range fees, targets, and ear/eye protection if needed. Bring your own handgun and ammunition. 1 hour minimum. Or, feel free to use one of my firearms for an additional $10/hour, plus the cost of ammo (must use my ammo with my firearms). I have a variety of handguns available for students to use, and I buy ammo in bulk to keep the cost low. Let me know if you have a specific style or brand that you are interested in. You may also rent a firearm from The Machine Gun Nest for our session. These matches are a great way to supplement your range practice, once you are comfortable with the basic operation of your firearm. It's not just for expert shooters. There are plenty of people just like you and me who want to have fun, meet new friends, and build confidence with their firearm in a safe environment. Contact me if you would like to learn more about this exciting and rewarding sport or if you are ready to get started.